Zoho Flow helps easily bring your data together by connecting your apps and automating information exchange among them. That way, the data you need is always complete, and available in the right app at the right time. An essential part of a marketer’s job is to connect well, not just with customers, but also with the team. Zoho Flow makes this easy for you — it automatically handles routine tasks like reporting stats and scheduling meetings, freeing up more of your work time for what you do best. 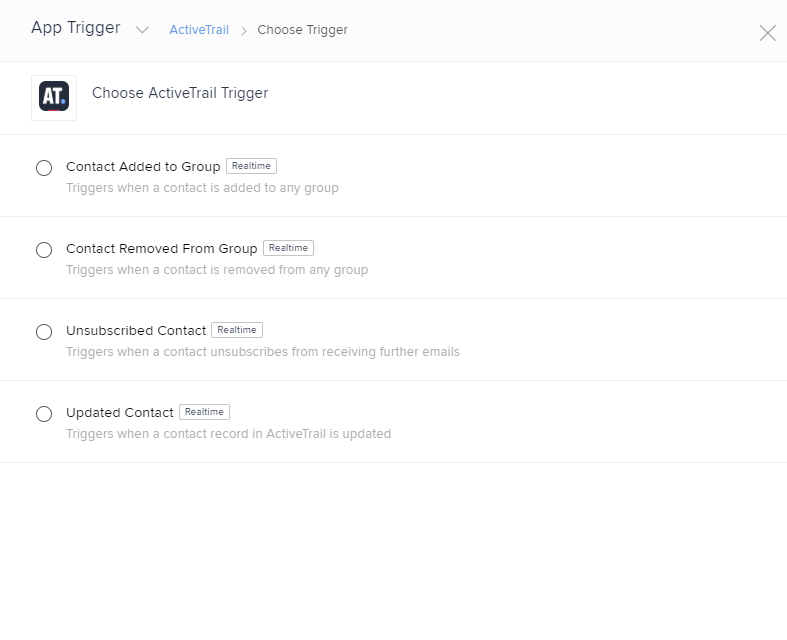 This flow automatically creates a contact in ActiveTrail for every new attendee added to Eventbrite. This flow adds a new contact in ActiveTrail each time a new customer is created in BigCommerce. Each time a new charge is created in Stripe, this flow automatically sends an SMS to the customer via ActiveTrail. Each time a new contact is added in Google Contacts, this flow creates a corresponding contact in ActiveTrail. This flow sends a channel message in Slack each time a contact is created in ActiveTrail. Every time a new response is submitted in Jotform, this flow automatically creates a corresponding contact in ActiveTrail and adds them to a specific group. 7. Zoho CRM-Zoho Books-ActiveTrail: Create ActiveTrail contacts, and filter a specified type into Zoho Books, for new leads in Zoho CRM. Whenever a new lead is created in Zoho CRM, Zoho Flow uses decision logic to identify the status of the lead. If the lead is pre-qualified, the flow creates a contact, adds them to a group in ActiveTrail, and also makes a copy of the contact in Zoho Books. If the lead is not pre-qualified, Zoho Flow further checks if an attempt was made to contact the lead, and if it was successful. If either is true, the contact is automatically added to a different group in ActiveTrail. How to create a new connection? Creating a connection lets Zoho Flow exchange information between apps. Select a trigger and click Next. If you are using an action, drag and drop it to the builder. – If there are no existing ActiveTrail connections in your account, click Connect. Otherwise, click New Connection. – Enter a connection name. – To get your API key, log in to your ActiveTrail account. On the top bar, click More, then Integrations, then API, then Apps. – Click New. In the popup that opens, enter the name as Zoho Flow. The other details are optional. – Click Save and copy the API key that appears on your screen. Note that this API key will not be visible to you again for security reasons. And that’s it! 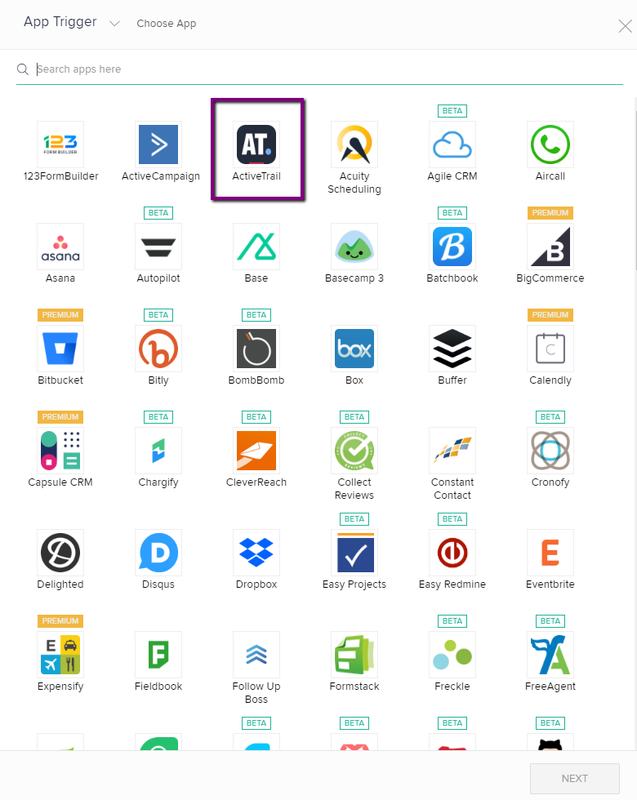 Congrats, you can now integrate your cloud applications with ActiveTrail.